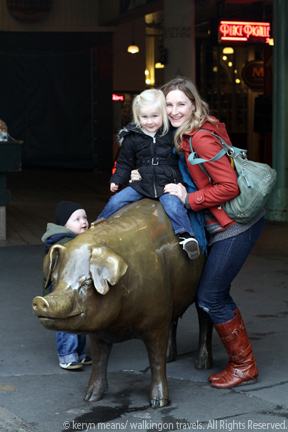 The pig at Pike Place Market is a draw for kids young and old. Give him a ride or even a little kiss. 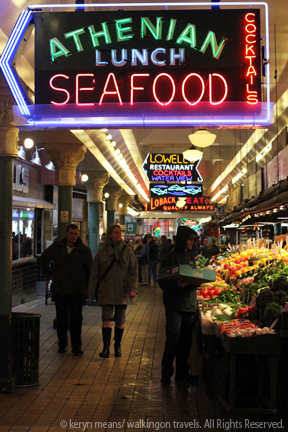 The Pike Place Market is one of those Seattle icons that everyone visits when they come to town. Tourist swamp the small walkways and stand gaping at the fishermen as they throw a $200 fish through the air. Oddly enough, it is also a place that locals frequent. I tend to steer clear of any tourist congestion whenever possible, but even I can’t help myself from running down to check out the fresh produce or grab a sandwich at my favorite spot. When we were presented with a beautiful, sunny Wednesday morning, my friend Nic and I decided it was time to head down with the kids and do a little exploring toddler style. The beauty of the market in winter is that the crowds aren’t as heavy. If you go in the morning you can practically have the place to yourself. Shopkeepers were still setting up when we arrived at 9:30am. But what to do with toddlers in a market full of goodies? Oh boy, what is there NOT to do. First off, no morning visit is complete without a stop at the Crumpet Shop. We fuelled up on coffee, steam milk and some fresh out of the oven crumpets. The kids got boring ole butter crumpets. Nic and I shared the decadent maple butter crumpet along with a ricotta, honey and walnut topped crumpet. It may sound like a strange combo, but trust me it is amazing. 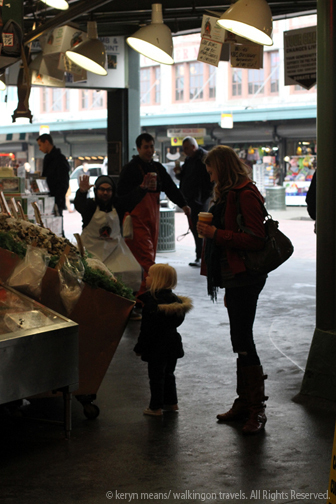 Pike Place is not only a spot to grab a bite to eat, but you can also load up on household staples, like spices from the Market Spice, or pick up fish and produce for your dinner that night. Your hubby may need to take the hint (as mine rarely does) and head on down to take advantage of the amazing flower deals. 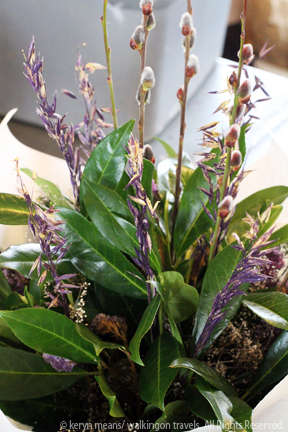 Fresh blooms for $5, $10, or $15 really can’t be beat. In the winter the stalls mostly have dried arrangements, but any day now the tulips will come pouring in. By summer bouquets with peonies, crocosmias and dahlias will fill the air with their sweet scent. There is no end to the entertainment either. Street performers, each licensed by the city, have their designated spot in the market and time slot. 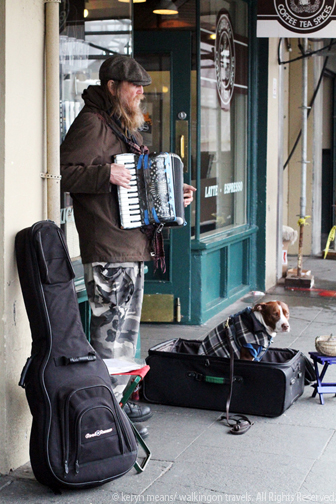 Enjoy a harmonizing duo, tap dancing blue grass band or just a lone guy with his guitar and dog by his side. For a little educational moment, hop on over to Beecher’s Handmade Cheese to watch the masters at work. 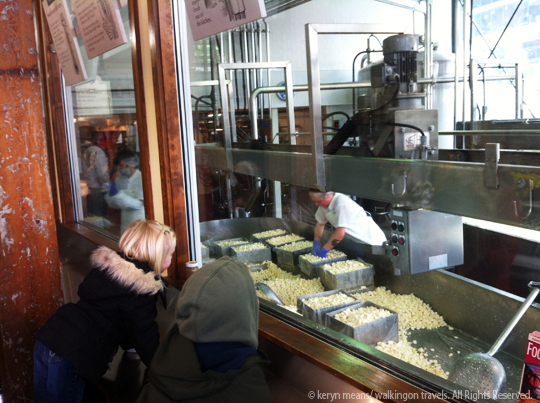 We caught the end of the show as employees scooped up cheese curds from the latest batch. Afterwards we helped ourselves to a few free samples. Mind you this was after the fruit sampling we had been doing earlier in our meanderings. 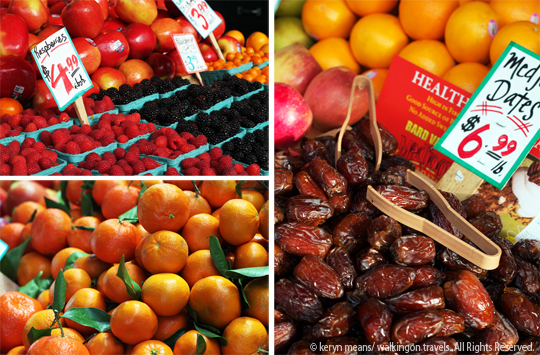 Did you know there are heirloom oranges? Delicious! 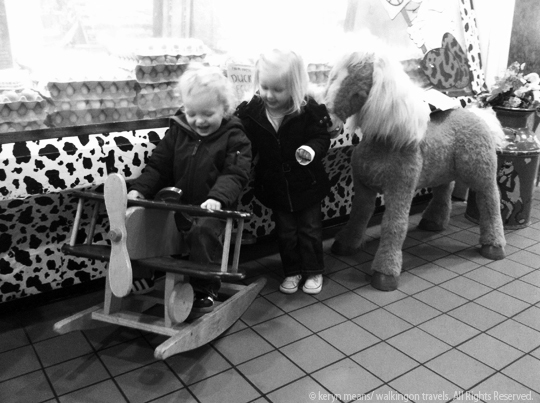 To round out our morning of toddler fun, we headed to my favorite sandwich counter at Three Girls Bakery. They really know how to stack on the pickles, which are the perfect complement to their chicken salad sandwich. With a hint of pineapple in the chicken salad, a little dill adds the tang my growing belly craves. Arriving at the market early gives the kids a bit more room to run without getting lost in the crowd. Open 7 days a week, 362 days a year. 9am-6pm, but some restaurants within the market are open earlier for breakfast or later for dinner. Parking is available in lots around the market. You may also be able to find parking on the street. All charge fees during the day. Be extra vigilant about reading signs carefully for tow zones. This is not the best stroller spot, especially in the summer. If your kids love to walk, let them. If you have a baby, strap them into your baby carrier. It will be easier to maneuver the crowds. Go early in the morning or late in the afternoon, especially in the summer, to avoid the crush. There are several levels to the market. If you have little legs traveling with you, you may not be able to explore all of them. Even the top level is more than enough to keep you entertained. Enjoy the free samples. You are getting to know the city and all it has to offer one bite at a time. Nic and Lee get cozy with the pig. Boston St.: The Children’s Everything Store has great finds although it can be pricey. Check out their collection of Tin-Tin t-shirts and gear or grab a gift for the punk rock baby in your life. 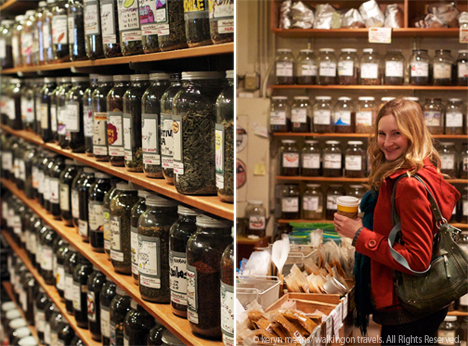 I LOVE this post – we visited all of these places when we were there 2 years ago – I LOVED MarketSpice!!!! 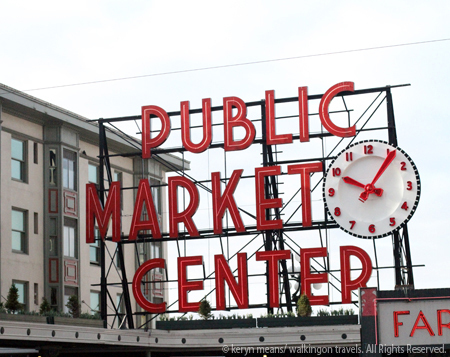 I would love to visit Pike Place! Is there actually a Starbucks still there or is that just where it got started? Lisa- there is a Starbucks there that many say is the 1st ever, but actually the first was knocked down or converted into something else, so they call the pike place one the original now. When you come visit us (which I know you will!) we’ll go exploring. Lori makes us go down there every time we’re in Seattle, but it’s not my favorite place. Too many panhandlers hanging around, although not within the market itself. I don’t mind the city licensed performers, but there’s way to many beggars around who don’t take no for an answer. 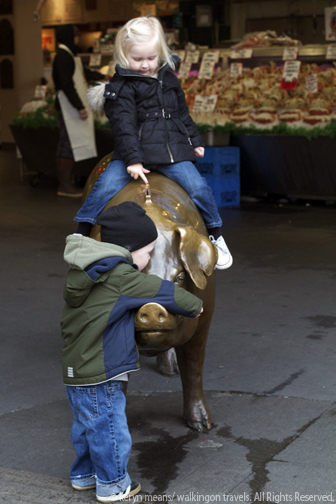 Love the top shot of Dek wrestling with the pig! 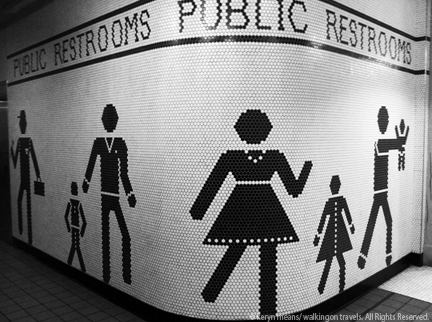 I’ve grown up in cities all my life. I think I’m a little too used to pan handlers. For me it’s more crowds of tourists that I like to avoid, which is why I hit up the market in winter the most or early in the morning before the cruise ships come in. Much quieter and so much more enjoyable for everyone. You’ve inspired me to go to Pike Place soon, weather permitting! I love Seattle! The great thing about the market is its covered, so even if it’s raining you can do some great exploring down there. I always forget it is an option on rainy days. Oh yes! Good point, I will have to go there soon, even if it’s raining. Went there last year for the first time, and I’m proud to say I was selected by the fishmongers to be the lucky tourist who got to catch a fish thrown by the guy across the market. Very fun. So cool! I once shot a wedding down there and the fish guys let the bride kiss a fish. It was a hilarious shot. Beautiful pictures! This market is one of those things that I really want to see. Thanks for sharing your adventure. Great photos! You always look like you are having such fun on your outings! If only I was in some of the pictures to show that I’m having fun too 😉 But we always have a blast for sure. Never a dull moment around here. One day I’ll slow down I’m sure… maybe. What a fun looking place! I would be up on that pig in a heart beat!! I would love to shop there all the time. Note to self. Do not start catching up on everyone’s blog articles when you have not eaten all day in preparation for a large feast at night. All this delicious food it making me want to raid the fridge and ruin my dinner.